Mesut Ozil has been inconsistent this season and Arsenal’s new boss Unai Emery doesn’t believe that he can work in his formations. The gunners are currently in a mess because they offered Mesut Ozil a lucrative deal in the January transfer window and Unai Emery who is their new coach doesn’t believe that the German international has a future in his team, as he prefers a formation that doesn’t require a no.10. There are various reports that Arsenal offered Mesut Ozil to Inter Milan in the January transfer window. The gunners will be hoping to remove Mesut Ozil from their wage bill in the Summer because the German international is reportedly earning £350k-a-week wages, and this was one of the reasons why Arsenal did not permanently sign any players in the recently closed transfer window because they don’t want to violate the FFP rules. The Mirror claims that the gunners had offered Mesut Ozil to Inter Milan telling them that they ready to let go of him in the Summer transfer window but the report claims that the Italian club has said that it also doesn’t want to sign him because he is currently inconsistent. 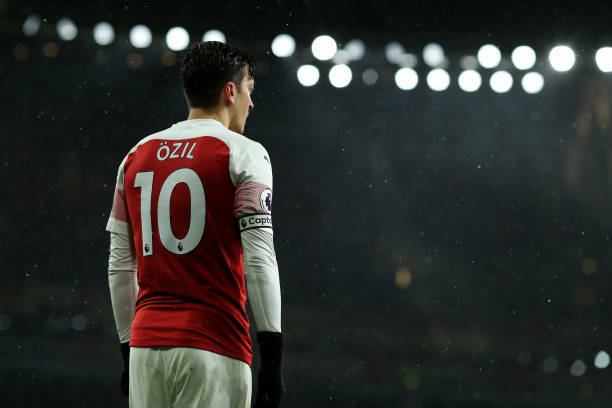 Mesut Ozil has not started many matches in the Premier League in this 2018/19 campaign than the past seasons because Unai Emery sometimes benches him or leaves him out of the 18 match day squad. The German international has not been very productive this season because he has made just one assist and scored three goals. Inter Milan have for long been interested in Mesut Ozil but the problem is that the German has huge wage demands since the gunners gave him a deal worth £350k-a-week wages because they were afraid that they would lose both Mesut Ozil and Alexis Sanchez at the same time.